For many, indoor gardening isn’t a pursuit solely focused on yields; it is also a relaxing and engaging hobby or business. Without the right lighting, your plants will fail to thrive, making what should be a fun venture a frustrating one instead. Luckily, there are excellent grow lights on the market today. 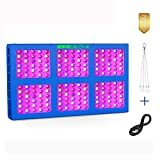 Meizhi is a manufacturer that, along with other products, creates LED grow lights that are considered a favorite by many indoor gardeners. If you are considering purchasing one, here is what you need to know about the company as well as a thorough Meizhi LED review. For over ten years, Meizhi has been creating durable and safe products for consumers and businesses alike. Meizhi is a well known grow light manufacturer and is recognized for providing budget-friendly options to indoor gardeners. Plus, a Meizhi LED grow light has very low power consumption, making them as economical to operate as they are to purchase. The Meizhi Reflector Series 450W even made our list of Best LED Grow Lights. Meizhi creates reliable, powerful LED grow lights. Nearly every option is full spectrum, ensuring your plants get precisely what they need to thrive at every growth, flowering, or vegetative phase. 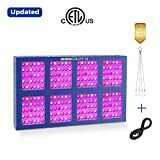 Additionally, ETL certification is common for these eco-friendly LED grow lights. Plus, most Meizhi LED grow lights have excellent features. Aluminum heat sinks, dense vents, and powerful fans all help with heat dissipation. They are also designed with durability in mind and have attractive designs, ensuring your Meizhi grow lights aren’t an eyesore. Since the company offers several options, this Meizhi grow light review is going to look closely at the high and low ends of the spectrum. Then, we will take a quick peek at what else the company has to offer. 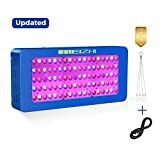 The Meizhi 300W full spectrum grow light blends white, red, and blue light to ensure your plants get everything they need to reach their full potential. This system provides good coverage for its size and has an excellent PAR value. This Meizhi LED grow light is also very efficient. It can replace a traditional 300W bulb while only pulling 139W of power. If you want to keep your electric bills low, then this is a great option. Additionally, this Meizhi grow light has switches that allow you to adjust the light spectrum based on the growth phase. You can optimize the light for seedlings, blooming plants, and harvesting phases all with some simple clicks of a button. It is important to note there are only two infrared LEDs. Some may consider this to be too few. However, the 120-degree reflector panel helps focus the light onto your plants, improving the distribution. Essentially the most powerful option from Meizhi, the Meizhi 1200W LED grow light provides excellent coverage. A single unit can cover a 4-foot by 5-foot grow bed when positioned at a height of 18 inches. If you want to use a single light for a space of that size, this is the only light you need. Plus, the Meizhi 1200W full spectrum LED grow light is very efficient. You get 1200W of power for just 568W of energy consumption. This light is also built to last, with a potential life span of 100,000 operating hours. Like the 300W version, you will also find the dual switches on this Meizhi LED grow light, giving you more control. The 120-degree reflector panel also focuses the light well, ensuring it is directed toward your plants. Meizhi LED grow lights are also available in different wattages. Along with the two above, you can purchase 450W, 600W, or 900W Meizhi grow lights with ease. As a result, you can select a size that best meets your needs. You don’t necessarily have to buy several small lights to get your desired level of coverage or run a light that is more powerful than you need. However, if you feel multiple lights will serve you best, all of the wattages support daisy chaining. 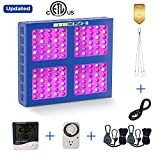 Not only is this convenient, ensuring you do not have to use more than one outlet, it also gives you a chance to control all of the lights with a single grow light timer. While these lights are reliable and durable, you can also rest assured knowing that Meizhi offers a great warranty. You get three years of warranty coverage and, if anything goes wrong within the first year, parts and shipping are completely free. Ultimately, Meizhi LED grow lights are a great option, particularly for beginners or anyone with a tighter budget. They are affordable, robust, and provide full spectrum, adjustable light. At the price point, Meizhi is pretty hard to beat.